Lagoon 2 at the Ko Olina Resort is a spot of contention among oceangoers, some of whom complain of inadequate access and parking spots there. Surfrider Foundation official Scott Werny raised questions about inadequate public parking for beach and ocean access at the Ko Olina Resort on Oahu. Maui resident Barry Brown complained to the county about neighborhood residents locking the gate to a public shoreline access at night in Napili. Kauai resident Caren Diamond went to court to guard against landowners encroaching on public beach lands by planting vegetation on Kauai. Across the state, residents are becoming increasingly active in preserving public access to shorelines, as urbanization increases and private landowners close off paths used by the public. The issue is reaching such prominence that groups have organized a statewide "Beach Access Protest," with rallies scheduled for 10 a.m. tomorrow at Kahului Harbor on Maui and at several locations on Oahu, including the state Capitol at 9:30 a.m. On Kauai a rally will start at noon at the Hideaway's parking lot fronting the Princeville Hotel. Protest organizers note that the state Constitution preserves the right of the public to use traditional, customary paths to access the mountains and ocean, even across private property. Public shoreline access also extends around each island, since the state claims all property from the ocean to the high-water mark of the coastline. But organizers note that many paths have been closed for lack of enforcement and willingness to preserve public rights-of-way by the counties and the state. While the City and County of Honolulu has a policy of establishing beach accesses every quarter-mile in urban areas and half-mile in other areas, county public pathways total 89, or roughly one for every 1.25 miles of coastline. City Parks Director Les Chang said the policy is only a guideline, and added that public beaches are also access points. The biggest challenge to adding more public access points would be acquisition of land, he said. 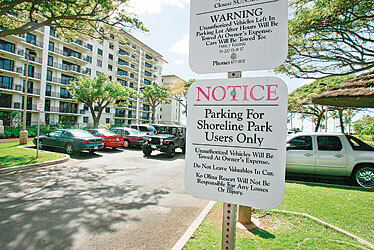 Werny, Oahu chairman for Surfrider, said oceangoers find inadequate parking at Ko Olina. In response to concerns about parked cars blocking intersections and obstructing the view of drivers at Ko Olina, the state Department of Transportation began installing signs last week as a safety measure, said spokesman Scott Ishikawa. But the project has been placed on hold because of complaints as the department searches for a better balance between parking and safety. "We had good intentions," Ishikawa said. Oahu surfer Melissa Ling-Ing said the state Boating Division's proposed reduction of 270 free parking spaces at the Ala Wai Boat Harbor lessens the opportunity to enjoy the beach and ocean in western Waikiki. 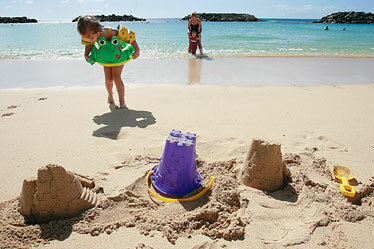 The public parking lot of Lagoon 2 at the Ko Olina Resort is for use by visiting beachgoers, but some say a recent Department of Transportation traffic safety project there has resulted in an inadequate number of public parking spaces. Ling-Ing said that because of the lack of free parking spaces, she has paid $17 for parking while surfing. "That's ridiculous," she said. In some places, recreational users have problems finding the beach access because of the poor location and the lack of maintenance of signs. Maui resident Barry Brown said Maui beach accesses are poorly maintained. Brown said that at a surf break known as "Little Makaha" in West Maui, foliage is often blocking the sign identifying the location of the beach access. "They let the foliage grow in so you can't even see it," Brown said. He said residents have also installed a gate to block the access at night. Oahu resident Rich Figel said the lack of adequate signage for beach access is also a problem in the Windward area, including North Kalaheo Avenue. Figel said one beach access sign installed to give the county access in emergencies is not visible from the beach because of overgrown foliage. "If you're on the beach, you wouldn't know it was here," Figel said. Some Kauai residents also object to landowners who have installed irrigation lines and plant vegetation to extend their beachfront property. Diamond said the plantings discourage people from using the beach and also are an attempt to reduce width of state lands. Under Hawaii law the state owns submerged lands and all coastal lands up to the high wash of the waves, and landowners have been extending their plantings to try to prove that the high wash is up to their vegetation line, Diamond said. "What was once 50 to 60 feet of sandy beach becomes the vegetative front yard for somebody," Diamond said. Sam Lemmo, administrator of Office of Conservation and Coastal Lands, part of the Department of Land and Natural Resources, said encroachment is a big issue for the state because the vegetation interferes with people's ability to traverse the shoreline laterally. "We're getting complaints all the time about the vegetation issue," Lemmo said. "We're trying to get a handle on how to address it because it is such a big issue across the state."